Review: Baby Cakes Treasures - Jade Alana Marshall Design. 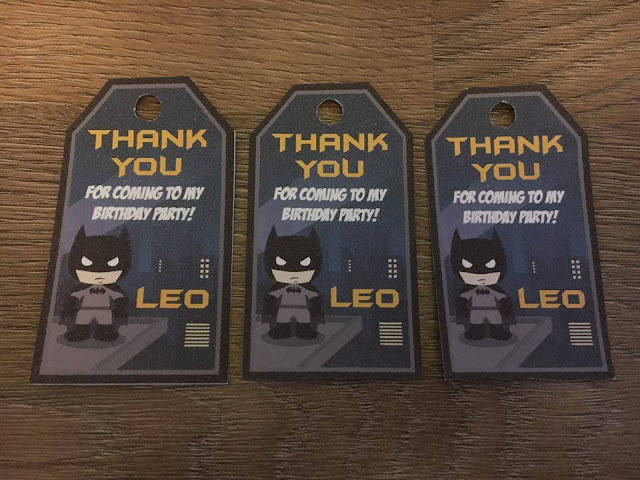 You may recall a post I done a couple of months ago mentioning Spud's birthday party, and it being Batman themed!? If not, go and have a read, or you can skip that and read this post instead, a post on someone who's already been mentioned a few times on Unique Young Mum, and I have no doubt this won't be the last time! The company in question is Jade Alana Marshall, the graphic designer behind my beautiful floral layout that I had until recently (if you're new and have no idea what I'm talking about, check out my social media pages - ahem Facebook and Twitter!). First of all, let me tell you a bit about Jade - the sole person behind Baby Cakes Treasures, Jade Alana Marshall Design, and JAM Personalised. I first came across Jade a couple of years ago whilst stalking Twitter (as us bloggers do, am I the only one who spends more time on Twitter then doing anything else!? I can't be alone surely! ), seeing she had designer in her profile (and me having an interest in design - I miss the MSN group days!) I stalked her profile and found she had a website, and from there fell in love with her work. Soon enough, Jade was the person behind my first professional and beautiful layout, and the only reason it was replaced a few months ago was because blogger had changed ever so slightly and I needed something to be done about my SEO - jargon that doesn't mean a lot to many of us! Anyway, a few months ago, planning Spud's sweet 11th birthday party, knowing it will be his last primary school aged party, I wanted to go all out, and I mean allllll out! I wanted it big, I wanted it to be the best, and if I had my own way, MTV would've been here recording us - leadup and all! However, I had to find ideas myself, and with a bit a LOT of help, the party was a huge success! So far I've shared the local face painter with you all, and now its time to share Jade with you all, and her wonderful designs! 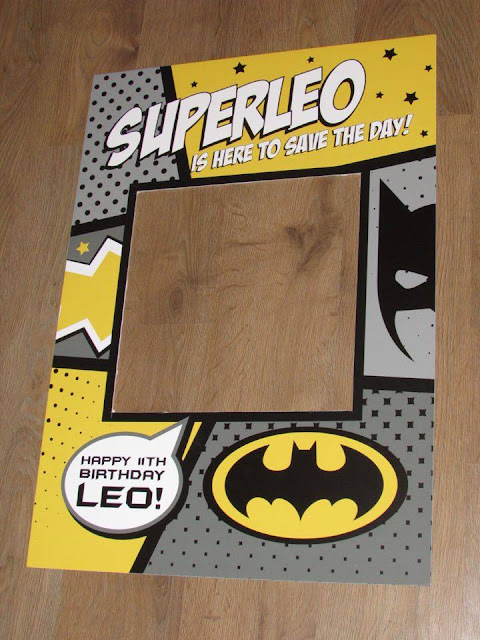 Searching through Pinterest, as a lot of us parents do for birthday party ideas, I come across selfie boards and knew straight away I needed one at Spud's party, so off I went on my search - but I couldn't find a company anywhere in the UK that made them - not the style I wanted anyway. Then the lightbulb in my head turned on, and I knew there was someone who could not only make what I wanted, but also design it and have it suited just the way I wanted it - Jade. Sure enough, after sending a picture of what it was I wanted, Jade got to work on the design, and hit the nail on the head with what I wanted! 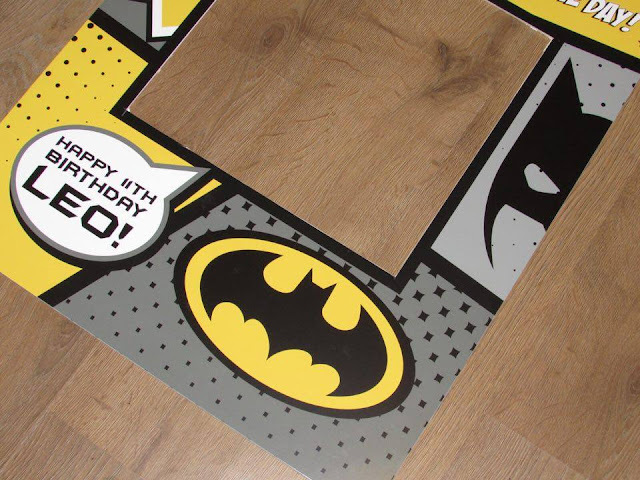 Jade needed ideas on the theme, and I simply said ''Batman, Yellow and Black'' to go with Spud's birthday theme, and as I expected because Jade's work is amazing, she come up with something better than I could ever imagine, the perfect selfie board. The selfie board was without a doubt the talk of the party, and everyone including the adults wanted to get involved! Each guest - children and adults had a picture of themselves holding the board, for Spud to look back on when ever he feels, it was to me - the best addition to the party. 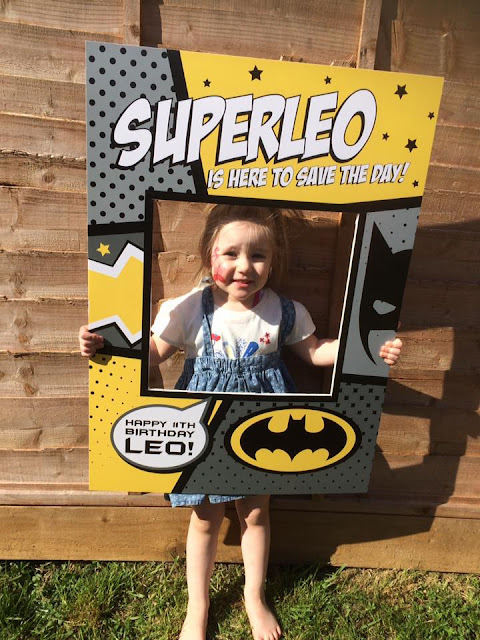 The selfie board cost £40, personalised and customised to your needs, it includes delivery, will be the perfect addition to any celebrations whether that be a birthday, Christening or wedding, you could even get one for Christmas - name an event and Jade can sort it. Jade's work didn't end there though... Busy with the party planning I received a message from Jade offering another wonderful addition to the party, this time something for the centre table, something for decoration purposes, but something that Spud can treasure forever - personalised letters, to go with his theme! Jade's sister was actually the person behind these, but she'll be selling these via Jade's online shop - just how talented is this family!? 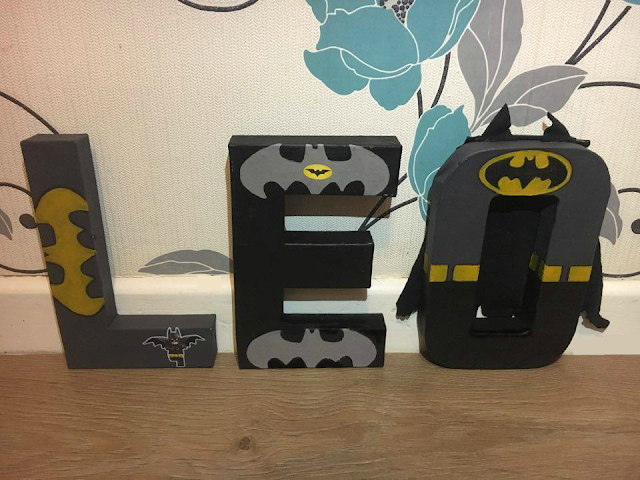 I love how each letter is different, all handmade, painted and designed by Jade's sister, the L features a yellow Batman style bat, along with a Batman sticker, whilst the E features two grey Batman styled bats, with one of them having a small logo sticker in the centre, and lastly the E - it has to be my favourite out of the three! It's features all three Batman colours, a hand painted Batman logo and Batman ears and a CAPE! The letters cost £8 each, personalised and customised to your needs, and include delivery. Mr and Mrs, Mr and Mr, Mrs and Mrs, a name, a celebration, you name it, and Jade can sort it! Last but not least, Jade also designed the favour tags for me (well for Spud but he had no idea about any of this! ), and I apologise for the poor image quality, my camera really doesn't give these tags the justice they deserve! 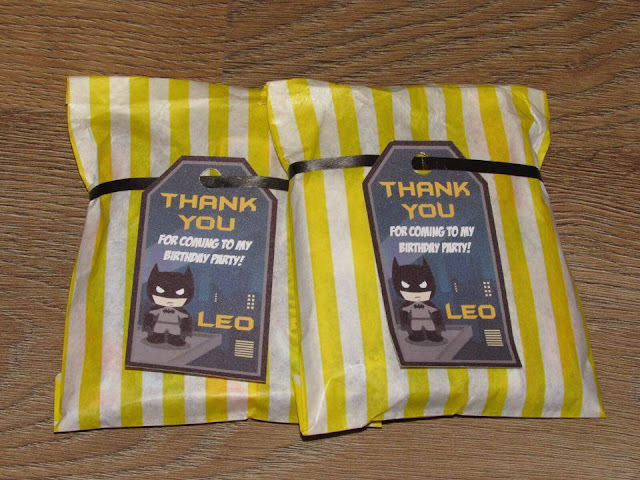 They're thick, of amazing quality, and perfect for favour bags! Again Jade can make these to any design of your choice, they cost £10 for 20 tags, but they're personalised to your choice, and the cost includes delivery too! Plus they're already cut out for you, as I know many tags from places like eBay don't come precut - and how Jade got them circles so perfect I'll never know! I remember trying to make something similar a few years ago, and the only thing I had to cut out circles was a lousy wholepunch - never again! I just leave these things to the professionals now! As you can see from the image below (again my camera isn't giving them the attention they deserve! ), they worked perfectly with the favour bags the children took home! Along with the three items mentioned in this post, Jade does a lot of other design work including layouts, social media designs, branding, logo's, prints, cushions, cards, invitations, bags and much more! You can find Jade over on her website - Jade Alana Marshall, or on Facebook. 5 Tips On Perfecting Your DIY Tan!